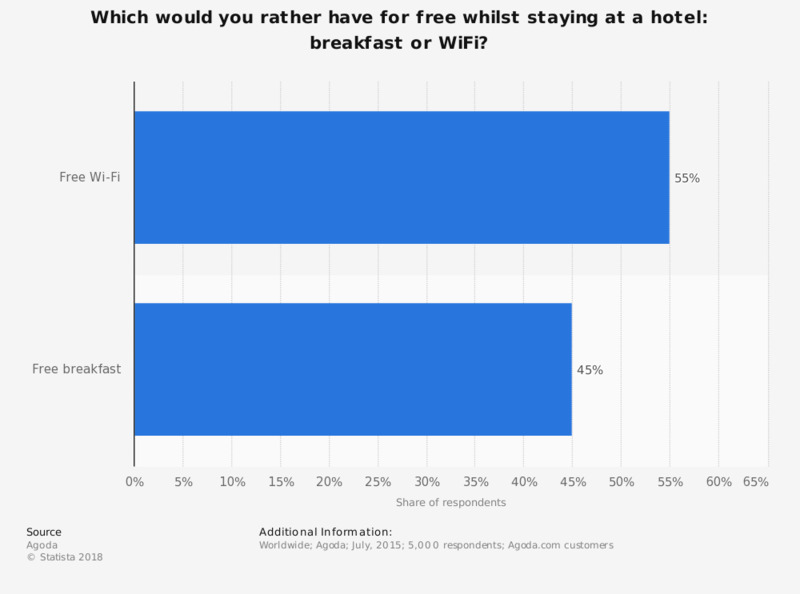 This statistic shows the share of travelers by whether they prefer free Wi-Fi or free breakfast, when staying in a hotel in 2015. During the survey, 55 percent of survey respondents said they would prefer free Wi-Fi when staying in a hotel over a free breakfast. The source did not provide information regarding the type of survey. Are you satisfied with breakfast in hotels in France in 2016? When staying at a hotel or resort, if there are loud noises coming from the room next door, what would you do? When staying at a hotel or resort, do you tip the maid service? Are you planning to increase, maintain or decrease room rates in 2016?